Taking on a robotic patriot. No big deal. “Bring us the girl, wipe away the debt.” So Booker DeWitt was told before embarking on his journey to the floating city Columbia to rescue Elizabeth, a mysterious girl who was imprisoned there since childhood. In this third entry of the Bioshock series, the setting departs from the the underwater city of Rapture in the 1960s to the skyborn Columbia, 1912. Columbia is about as hyper-American as one can expect in 1912. Upon arrival, you see a prospering culture with the requisite steampunk accents. Where I praise Irrational Games is that they wasted absolutely no time in showing the less attractive parts of American culture of that time. It doesn’t take you long to see that the population you see is almost homogeneously white American, and racism and xenophobia are law in Columbia. As the game progresses you not only see the conditions of the working class of Columbia, but what would happen if they were given the opportunity to revolt. As you go through Columbia with Elizabeth in tow, you can carry up to two guns and a full array of Vigors (replacing Plasmids from the earlier Bioshock games) as you shoot, melee, shock, raven, and plow your way through your enemies however you like. As much as I tend to make fun of the Call of Duty series, the thing they really got down pat is extremely smooth shooting action, and it looks like Irrational Games took some notes. I generally felt the shooting action to be a noticeable step up from the PS3 release of the original Bioshock, and that can also be partly the result of the level design being more open instead of the cramped corridors of Rapture. The battles come with absolutely drool-worthy set-pieces. Many times, you find Skylines, from which you can use a hook (which you also use as your melee weapon) to hang off and slide. Sometimes, you use Skylines simply to get from here to there. Others, you use them for your tactical advantage as you swing around your enemies down below, until you decide to jump down and strike an enemy on your way down. Adding to the variety is everything Elizabeth can do. Every so often, depending on what you’re lacking, she can toss you health, ammunition, or Salts, which you use to power your Vigors. In addition, you can tell her to open up a Tear between realities, and summon things like a helpful machine gun-equipped robot or a health pack station. Elizabeth is tied with The Last of Us‘ Ellie as the most awesome video game sidekick ever. When you first meet her, the game tells you, “When in combat, there is no need to protect Elizabeth. She can take care of herself.” Capcom should take notes so as to not make another Ashley Graham ever again. Not only does she help you in combat and pick locks for you, but Elizabeth is in general a character who will really grow on you, partly due to Courtnee Draper’s voice acting. 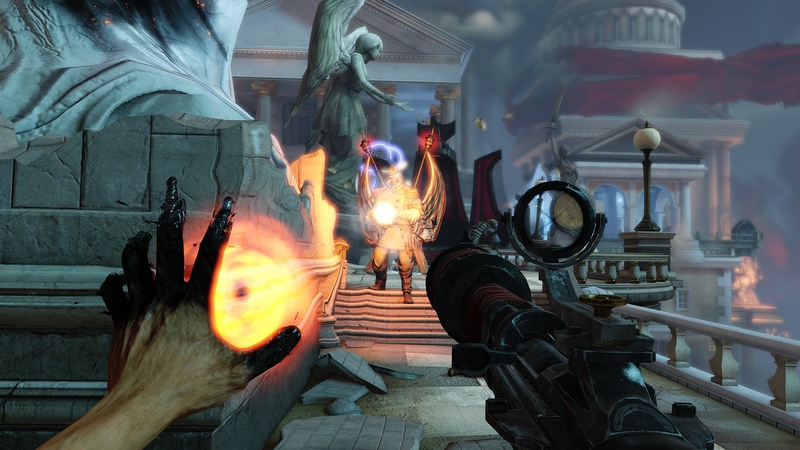 Bioshock: Infinite could very well have just become another first-person shooter, but it succeeds due to the strength of its narration. You’re in a believable world thanks to first rate art direction. You see a society mirroring old school American ideals, which can make some players angry, and Irrational Games does not care. You will shoot your way to an ending that will make your jaw hit the floor and stay there for days to come.